…flags off project to ensure aflasafe products reach farmers’ hands. Drs Dashiell, Bandyopadhyay, and Konlambigue at the press conference. killer, would soon be made available in at least 11 countries in sub-Saharan Africa. Following the success of aflasafe—the first indigenous biocontrol innovation for the prevention of aflatoxin contamination on the fields and store houses of maize and groundnut farmers in Africa, IITA is now set to enable commercialization of the technology, to ensure that farmers in need of the product d have access to it. More than 4.5 billion people in the developing world are exposed to aflatoxins, carcinogenic poisons produced by a fungus that contaminates crops. Aflatoxins are detrimental to human health, and can even cause death. They suppress immune systems and are associated with stunting in children. Aflatoxins also reduce crop value—at least $450 million in commerce is lost annually to African economies due to aflatoxins. Aflasafe was developed by IITA, United States Department of Agriculture – Agricultural Research Service (USDAARS), and national partners. So far, it has been reported to achieve up to 98% efficacy in reducing grain contamination on the fields and stores of farmers where aflasafe products are registered or in the process of becoming nationally registered. The new aflasafe Technology Transfer and Commercialization Project (aTTC), funded by a $20 million grant from the Bill & Melinda Gates Foundation and USAID, was launched last December 2016 to be implemented in countries that include Burkina Faso, the Gambia, Ghana, Kenya, Malawi, Mozambique, Nigeria, Senegal, Tanzania, Uganda, and Zambia. aTTC will be led by IITA with support from USDA-ARS, Chemonics, Dalberg Global Development Advisors, the Partnership for Aflatoxin Control in Africa of the African Union (PACA), national institutions, and Regional Economic Communities such as the Economic Community of West African States (ECOWAS). aTTC is working with business partners that can help to achieve the goal of producing an effective, affordable product that would ensure that farmers, consumers, and communities are protected from the deadly effects of aflatoxin contamination. “To get aflasafe to the masses, we need many companies, millions of small-scale farmers, and distributors, who know what aflasafe can do to apply it. IITA is excited because the Institute is on the edge of reaching this goal,” IITA Deputy Director General, Partnerships for Delivery, Kenton Dashiell said. 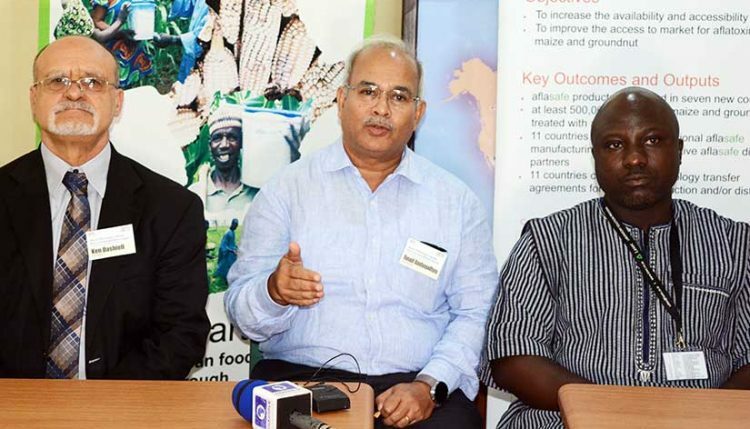 Corroborating the need to work with private businesses in getting the technology out, Ranajit Bandyopadhyay, IITA Plant Pathologist and leader of the Africa-wide aflasafe initiative who has been working on the product for more than a decade now, noted that “This product is indigenous! Developing the technology was not difficult, taking it out to the end users is the challenge; therefore, partnership is very crucial”. The aTTC project is designed to identify and enable partners for manufacturing/distribution of aflasafe, and increase its availability. The launch event in Ibadan had researchers, farmers’ organizations, and private and public sector partners in attendance. Also speaking at the launch event, Amare Ayalew, Program Manager, PACA, highlighted the need for disseminating the innovation to the farmers. “African farmers need game-changing research technologies like aflasafe to meet aflatoxin standards for international trade and also to nourish their families and other people who eat their produce with wholesome products,” Ayalew stated. 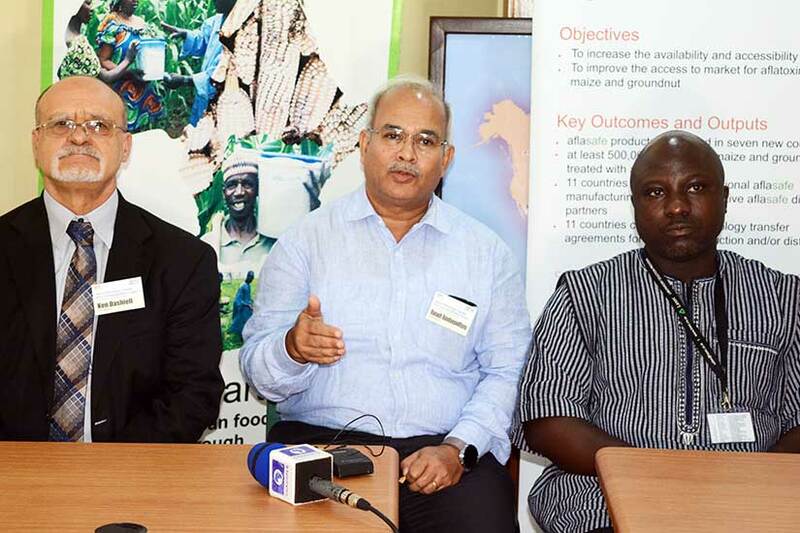 aTTC Managing Director Abdou Konlambigue said that the project is designed to identify strategic options for partnerships with private companies, and/ or government entities, execute those partnerships, and help ensure that aflasafe reaches millions of farmers throughout sub-Saharan Africa.